Details on the core races and how they fit in the city as well as new player character races such as the Azhar and Crag Gnome. New base classes, including the monster hunter, survivor, and assassin. Over 90 new feats that capture the mood and atmosphere of the City of Adventure, featuring cool options such as Run 'im Through, Horrific Summoning, Harrowing Surge, and Swashbuckler. Over twenty new spells including the nasty unbinge, bewilder, and body of eyes. A treasure trove of revised magic items such as the rapier of revenge, rod of the buccaneer, and the Stylus of the Unspeakable One. New and revised monsters, including the freakish blemmyae and the dreaded burnlings. Statistics for common folk of Freeport, such as watchmen, thieves, and merchants. Statistics for over 75 key characters described in The Pirate's Guide to Freeport including heroic allies such as Buster Wallace and K'Stallo and terrible villains including Red Alice, Prendag the High Death, and Kothar the Accursed. Fury in Freeport: An adventure to help you launch a brand-new Freeport campaign! 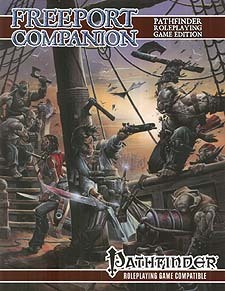 The Freeport Companion: Pathfinder Roleplaying Game Edition is your rules guide to exploring Green Ronin's Freeport, whether as a daring hero looking for adventure, or as a Gamemaster seeking new worlds to explore. This sourcebook is an indispensable accessory for fans of both Freeport and the Pathfinder Roleplaying Game!